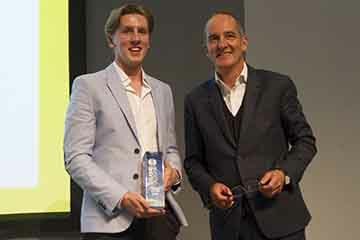 Writtle University College - Alumnus named Garden Designer of the Year 2014 at Grand Designs Live! Alumnus named Garden Designer of the Year 2014 at Grand Designs Live! Writtle College alumnus Liam Sapsford has been named Garden Designer of the Year 2014 at the Grand Designs Live show! Liam, who graduated last year from Writtle College with a BSc (Hons) Landscape & Garden Design and now runs his own business in Brentwood, was given his award by designer and television presenter Kevin McCloud at the London Excel show. The 22-year-old, who has worked on high-end gardens through his business Liam George Sapsford Designs, said: "Winning Grand Designs Garden Designer of the Year is the greatest thing I have achieved. For Kevin McCloud to say that he has never seen anything like this before about my design is a trophy in itself. Liam’s passion for garden design was born from a fascination with bonding science and art to create the perfect outdoor space. He credited Writtle College with setting him up in his chosen career: “I would like to say how much Writtle College has guided me to getting this far. What I learnt at Writtle has not only given me great design qualities but taught me about the business aspects of the garden and design industry. Liam was one of only four designers shortlisted in the competition, which is in its second year. He had to create a show garden based on the concept of ‘Introducing Colour to Your Garden’ and inspired by the Grand Designs Live ethos, which includes contemporary style, inspirational design, and ethical and environmental responsibility. His garden, called Controler la Couleur, is based on luxury coastal space but transported it into the homeowner’s garden. It features a typical beach hut, but, without its constraining walls, therefore freeing the space and leaving a sturdy skeleton made of reclaimed railway sleepers. Weathered decking and stones underfoot add nostalgia while low maintenance planting provides architectural qualities. The principle of sustainability is also present in the garden - recycled yacht sails as wind shields give privacy, recycled tiles create a voluptuous mosaic and paintings portraying a vision of the glorious British coastline are made of torn boat sails. Liam drew his inspiration from the acclaimed US landscape architect Steve Martino – who headlined last year’s James Hearsum Lecture Series at Writtle College – and his ability to transform dry gardens into beautiful, healthy and sustainable living spaces. The concept’s soul, Controler la Couleur, was also influenced by the vibrant French illustrator, Malika Favre. The gardens were judged by an esteemed panel including garden and landscape gardener James Alexander-Sinclair, Grand Designs Live ambassador and broadcaster Kevin McCloud and Lee Newton, Managing Director of Media 10 and owner of Grand Designs Live. Liam’s garden can be seen in the Grand Gardens section Grand Designs Live London up until 11 May at the London Excel.